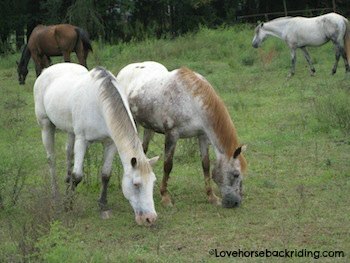 Here you can enjoy some white horse pictures, although they are really grays. On my last page I explained why this color is so rare in the equine world. This is one of the best pictures because you can see three different variations on the light coloring. The animal to the far left looks pretty light although his legs are darker gray. He has a pink nose. I would guess that he is of Appaloosa background because of his vertically striped hooves, and mottling around the nose. The horse to the right of him looks kind of light, too. See how he has a very white behind? He is a darker base with white hairs blended in which is called roan. Then in the background on the right side there is a gray that is also pretty light. He still has darker gray points which may turn lighter as he ages. 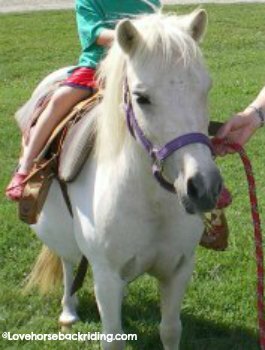 This mini looks white, but he is actually a palomino paint. If you look to your left you can see that leg and shoulder are much lighter than his chest and the other leg. He is an extremely light palomino, but still two different colors. This is one of the best pictures, and truly a stunning animal. The heavy feathering on the legs is common in draft breeds. Many times, these animals are born dark or steel gray. As the years go on, they become lighter and lighter until they appear to be white. This is similar to what happens to us as we age, too. They look like a different animal every year until they reach their final color. The rate and degree of this process depends on the individual genetics. Not all animals will end up as light as this beautiful steed. Many also go through a stage where they have "dappling" and that in itself is stunning in any color. 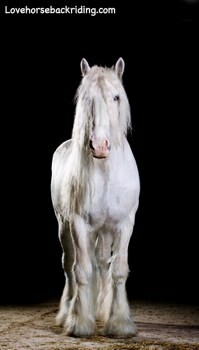 I hope you have enjoyed these white horse pictures. There are many more to be found of different breeds and colors. Galloping on back from white horse pictures to the home page to find more stunning pictures, training, and riding tips.